One of the most exciting clubs in the Southwest is second year club, FC Grande. Based in Las Cruces, New Mexico, the club was set up by an owner who can only recently buy beer! The young and driven owner, Alexis Ruiz, sat down with Protagonist to answer some questions about FC Grande. So tell us about your club. FC Grande is a club based in Las Cruces, New Mexico. We play in the Southwest Conference of the United Premier Soccer League. What gave you the idea to start a club? I had always believed Las Cruces had the potential to have a solid professional team so I came up with the idea of joining the UPSL to give my friends and I a shot to play soccer at the next level. I had went from business to business asking for sponsorship to help fund this idea of mine. I went to many locations around Las Cruces and got told “no” most of the time. Luckily, a few businesses reached out after a few months that’s when it all began. Las Cruces, NM is relatively isolated compared to other UPSL cities. What kind of soccer talent is there and what has your club done to attract it? I would say there are a lot of technical players out here. We’ve always had small teams come out of Las Cruces, so we were always taught to keep the ball on the ground. Its something we focus on at FC Grande. Possession is ideal. FC Grande got a lot of recognition for our run last season. We made the conference final but fell short to a solid Sporting AZ FC squad. I would say most of the soccer community knows who our club is. We have the most competitive team in town, as far as the next level, that is. We recently started an academy! We currently have three teams and are looking to add more this spring. Why do you think your club was so successful season 1? What would you advise other clubs to do to replicate that sort of start? The work ethic of these men and the support of our fans. These two things were crucial to our first season. The men spend countless hours on the pitch, in the gym, and on the tracks. We all pushed one another and never gave up. We would wake up as early as 4:00AM to go on team runs and hit the gym right after that. We worked, worked, and worked. We had many locals come out and support our games. Many soccer fans and many who weren’t soccer fans. We always got great feedback from them! There really isn’t anything like a Saturday night at High Noon Soccer Stadium. We couldn’t have done it without our great supporter group, Notorious FCG. Those guys really know how to hype up a crowd!! They bring a certain energy you really can’t get anywhere else and that’s facts. 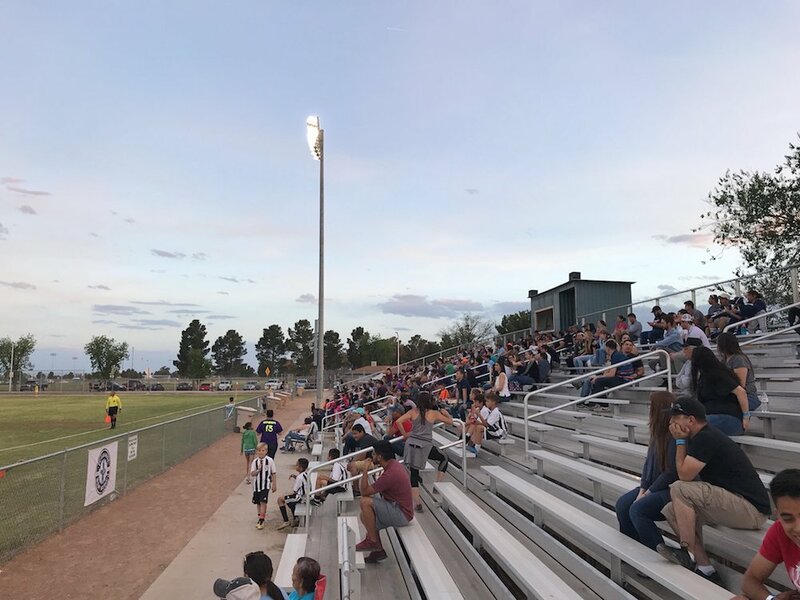 The UPSL Southwest has added several clubs this offseason, how do you feel FC Grande will stack up against the new clubs? I think we will give all these clubs good competition! We are looking to add more players this spring season. We have a lot of older players who are interested in putting the boots back on for this next spring season. Many of them played academy or college ball. That experience could really help out a lot of the younger guys. I’m confident that we will have a more talented squad this upcoming season. We are currently working to build the best roster possible. You’re young. Really young to be running a club. What has been your biggest challenge? I get that very often. The biggest challenge for me is transitioning from player to manager. At times, I have to take management roles while I’m playing. It’s kind of weird but I’ve made it work. Sometimes it becomes vert difficult though. These past few weeks I’ve been having to run training sessions because we are without a coach. I would much rather be a part of the sessions, rather than ran them, but you’ve got to do what you’ve got to when you’re chasing a dream. Your logo is slick. One of our favorites. Three questions: Who designed it? What input did you have? How important do you think a crest is? Thank you! We appreciate that. We get a lot of compliments on our crest. It’s a beauty! Custom FC had designed it. A gentleman by the name of Robert Boyd designed the FC grande crest. I had sent Robert some photos and samples of things that would look good on a badge and he basically took it from there. It took about a month to finish the crest but it was well worth it. The crest came out super nice. Robert is a very creative designer. Highly recommend him to any club looking to design or redesign their crest. I believe the crest is crucial to a club’s success. The crest is the very heart and soul of a club. It’s the first thing anyone sees. First impressions are a real thing! During this offseason, USL set up shop in El Paso (45 minutes East of Las Cruces). What sort of relationship do you hope to develop between the UPSL sides (Southwest FC and FC Grande) and Locomotive FC? We’re hoping that they give a shot to some of the men on our squad. We’ve got about five to six players who should be pro, including me haha, well at least I think so. Some of the men have the resume and experience for sure. Even the upcoming players putting their boots back on. If we had the best players in Las Cruces on FC Grande, we would give Locomotive FC a run for their money. I’m confident we will see them in the U.S. Open Cup one day. What else should we know about FC Grande? Come out and support FC Grande! This club has so much potential and will continue to grow. We will be hosting friendlies these next few months so keep an eye out for that! We are beginning pre-season now and will continue to work hard to put Las Cruces on the map. We are here to stay! For more information, check out FC Grande on Twitter.